Wait – how many matches in the MS-1 ? Sold my KV-1. That was a good value, got I believe 330k in credits. Grinded XP. Nothing earthshattering so no numbers this time. Gradually sliding down in wins, with all the challenging tanks I’m trying to play. 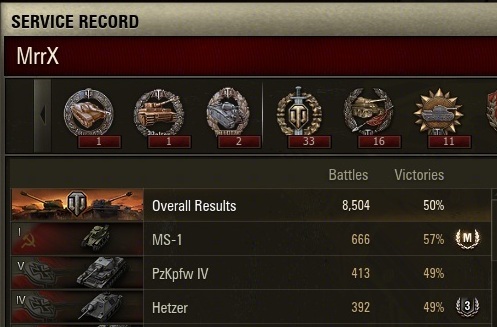 Really hating on the M10 Wolverine which is one-shot most of the times I play it. My finger is on the button to research the next tank with free XP every night, but so far I’ve resisted and want to stick it out. Reached 10m credits, and if I achieve another 500k planning to buy the VK4502A. Added the T29 and the Lowe to primary tanks – because, you know, trying to play 7 different tanks to a win nightly wasn’t hard enough already. Left the clan [Lin] because people aren’t on in my game time, and we never do clan wars anymore either. Clearly I’m not ready anyway – I have no T10. Almost there with a better gun, just need the turret now. This is a very enjoyable tank. Also watching with interest the blogosphere talking through The Secret World. When June 18th comes I’m going to have a decision to make, it seems. I’ve been watching the buzz about The Secret World and waiting for the announcement about when it’s going live. That would apparently be June 19th.